Saki-Hikari Turtle addresses the issues of smelly, dirty water. Lab-verified feeding trials confirm the odor-stop formula reduces unwanted odor while helping to maintain clearer and consistently better water. The highly tested and uniquely blended ingredients, including specific herbs, help reduce odor while increasing feed efficiency, which translates to less waste. These proprietary probiotics support intestinal flora and remain active in the waste to help decompose it making it less taxing on your bio-action. Added calcium supports the development of the outer shell while vitamin D3 improves calcium absorption. A uniquely balanced combination of nutritious ingredients that aquatic turtles desire, meaning no supplemental feedings are required. Feed once daily the amount your turtle will consume within a few minutes. In lower temperatures less food is required. 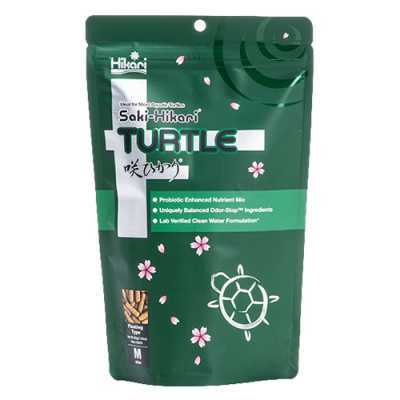 Saki-Hikari TURTLE is most effective when used without interruption as a daily diet. The Hikari Germ is a transitory bacteria that does not remain in the intestine and is quickly discharged once feeding is discontinued. Intermittent use or mixing with other diets will not allow the Hikari Germ to offer its maximum benefit.